First question: who are these people? Second: why do we care? My cynical response to this selection has much to do with my political orientation, although the footage is aesthetically painful as well. People file into a grandstand that is draped in flags and patriotic bunting. Someone on a platform speaks down to the crowd. A befeathered, helmeted troop of horsemen, brandishing ceremonial weapons, trots by. Here come some carriages. A balding man orates, gesticulating with sweeping Victorian-era rhetorical emphasis. It takes documentation to tell us what we are seeing – scenes from the second inauguration of William McKinley on March 1, 1901. These vague, static frames have no meaning unless they are contextualized. 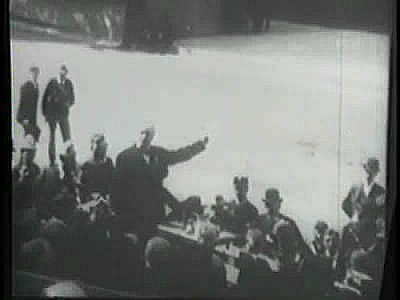 The only inherent interest in the event is the fact that is was the first presidential inauguration to be captured on film – the act of recording endows the event with significance. McKinley, an advocate of corporate consolidation and empowerment, and an architect of American empire, was perhaps the first media-savvy president. His campaign manager, Mark Hanna, spent tons of money on all forms of media support and promotion for his candidate, blanketing the electorate with pro-McKinley messages. Ironically, McKinley’s high visibility may have made him a more appealing target for his assassin, who shot him during McKinley’s well-publicized visit to the Pan-American Exhibition on Sept. 6, 1901. The urge to record significant moments isn’t new. The new technology of film simply invests the moments recorded with vividness. The hunger for “reality” means that McKinley’s assassination was later restaged for the cameras and presented as “real,” as were the execution of McKinley’s assassin, scenes from the Spanish-American War, and countless pseudo-documentary moments thereafter. Our hunger for verifiable, true-life entertainment continues today, with countless title cards that proclaim a hit movie is “based on a true story,” although the dull everyday facts are transmogrified into dramatic beats and inspirational or sensational plot lines. From now on, the camera ennobles the mundane, and politicos and other fame-seekers begin to strut and preen for a chance at celluloid immortality.